At some point in every woman’s life, the ageing process can become a concern. Each year, millions of Australians undergo non-surgical rejuvenation procedures to both look and feel their best. Statistics reveal that in 2011 alone, Australians spent around $560 million on these non-surgical procedures, with this amount increasing each year. More people are choosing to avoid invasive cosmetic surgery, which usually requires longer post-procedure downtime, is more expensive and many years ago was the only way to achieve skin rejuvenation. Advancements in modern medicine have enabled the development of effective non-surgical procedures that produce more natural results, without the drastic change that can completely reshape the face or body. The nature in which a person’s skin will age is influenced by intrinsic (internal) and extrinsic (environmental) factors. Intrinsic or internal factors are genetically predetermined. Such factors can include hormonal influences such as menopause, which can lead to premature ageing; skin cell turnover rate which can impact skin structure, resulting in the loss of skin and fat tissue; and factors such as skin hydration levels and levels of dermal collagen and elastin production. Extrinsic or environmental factors can include accumulated exposure to UVA/UVB sunlight, smoking, diet, and environmental exposures such as exposure to extreme temperatures, dirt or chemicals. Make an appointment with Hayley today! What can ageing skin look like? 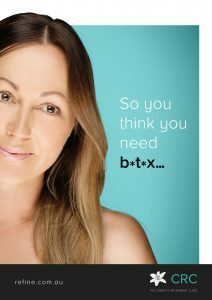 So, you think you need B*T*X? Download our guide to anti-aging and decide for yourself. This is the gold standard for all those concerned with ageing. The term “fractional therapy” describes a technology where only a fraction or a small percentage of the skin is treated. The surrounding untreated tissue acts as a reservoir for nutritional and structural support, which allows for a quicker recovery time in comparison to more old school technologies such as the CO 2 Laser. Find out more about the Pearl Fractional Laser Treatment. These treatments encourage a mild exfoliation to the surface layers of the skin, which improves the skin’s overall barrier function, increases collagen and elastin production and increases the skin’s hydration levels. Find out more skin chemical peels. This popular treatment combines laser therapy with the added benefits of an intensive skin treatment. The laser component stimulates collagen and elastin production, visibly improving the appearance of fine lines and wrinkles. The intensive skin treatment further facilitates collagen and elastin production but also improves the skin’s hydration levels and overall barrier function. Find out more about the refine laser rejuvenation treatment. This particular procedure is commonly referred to as ‘skin needling’. Micro-needles are delivered deep into the dermal tissue to instigate increases in collagen and elastin production. As a result, the dermal tissue thickens, which provides more volume to the skin as well as significantly reducing the appearance of fine lines and wrinkles. Find out more about Collagen Induction Therapy. To determine the most suitable treatment for you, we recommend an initial skin analysis consultation with one of our experienced and fully qualified dermal clinicians. During this consultation, your dermal clinician will thoroughly analyse your skin and identify any factors that have contributed to the onset of this aging process, as well as tailoring a treatment plan that will provide you with optimal results. All consultations cost $50.00 and are redeemable on any skin care purchases.